Many fish – such as carp, chub and minnow – appear to have no teeth but in fact have teeth in their throats, called pharyngeal teeth. Lampreys are the most primitive fish in the world. Fish were the first animals to evolve bony skeletons over 450 million years ago. Brown trout and sea trout are the same species but it is unclear why some seem to choose to migrate to sea while others stay at home. Some trout appear to leave for sea but then change their minds, and are known as “slob trout”. Eels only spawn in the Sargasso Sea and then the young fish can take up to 3 years to enter our rivers. Tench are known colloquially as the Doctor Fish as it was thought that other fish rubbed up against them when injured. The assumption was that the slime of the tench could cure injuries in other fish. 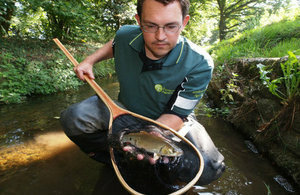 The Environment Agency breeds more than 400,000 coarse fish every year for restocking rivers after pollution or to give nature a helping hand. Male sticklebacks, like BBC Springwatch’s very own Spineless Simon, build a nest of vegetation to attract females. The males then closely guard the nests until the eggs hatch. Catfish, a non-native species in UK, has a whopping 27,000 taste buds compared to just 7,000 in humans. The eel is the only UK freshwater fish that can swim backwards. ‘Close season’ – which runs from 15 March to 15 June inclusive – is when coarse angling is suspended on rivers, streams and specified canals and stillwaters to protect spawning fish. Therefore 16 June is when rivers are effectively ‘open for business’ again after 3 months off. For more on rod licences and how to buy one through the Environment Agency’s web pages or direct from the Post Office Anglers can also buy a rod licence by calling the Post Office on 0344 800 5386 or by visiting any Post Office branch. Alternatively, you can buy your licence through the Angling Trust’s mobile-configured website. Whether at home or on the move, anglers can use this new website to get details on where to fish, tackle shops, clubs and coaches, plus all the latest weather and river levels.